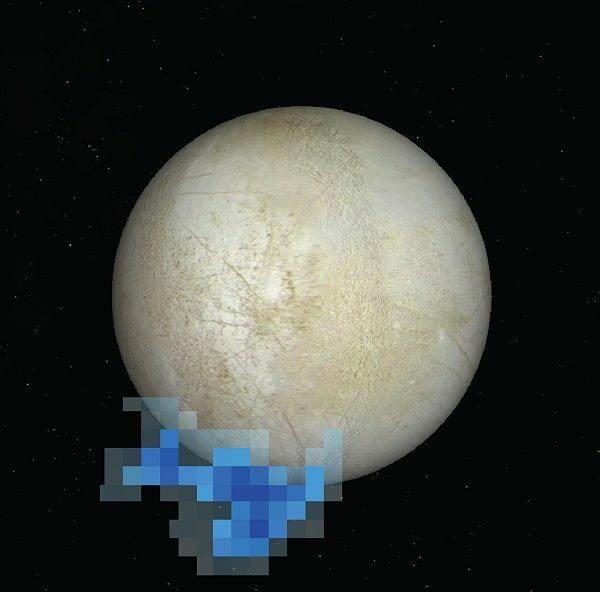 On December 12, 2013, astronomers using NASA's Hubble Space Telescope revealed that plumes of hydrogen and oxygen (probably in the form of water vapor) have been detected near Europa's south pole, leaking off into space. Astronomers do not know yet if these gas plumes are connected to subsurface liquid water or not, but this possibility is likely given the hypothesis of a subsurface ocean beneath the moon's icy crust (Hubblesite.org news release). Larger and jumbo composite image. On November 22, 2011, planetary scientists revealed in a pre-print that new calculations indicate that Jupiter's rocky core has been dissolving under the tremendous pressure of overlying mass since its creation some 4.5 billion years ago, which would explain why its core appears to be smaller and its atmosphere richer in heavy elements than predicted by theoretical models. Gas giants like Jupiter and Saturn are thought to have developed from solid bodies of rock and ice which generated sufficient gravity to attract atmospheric envelopes of hydrogen and helium gas when they attained around 10 Earth-masses. Some studies, however, have suggested that Jupiter's core now holds less than 10 Earth-masses, although the core of its smaller sibling Saturn appears to have some 15 to 30 Earth-masses. 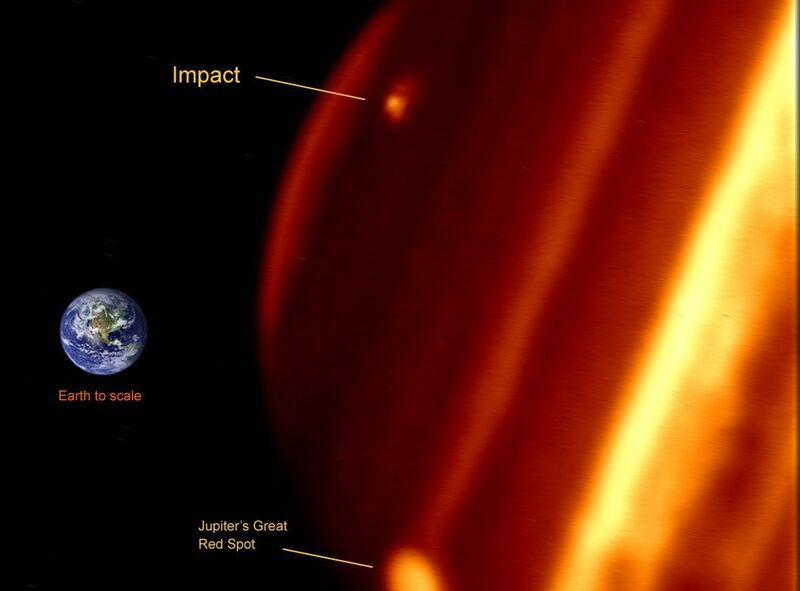 While some researchers recently hypothesized that a rocky planet larger than Earth slammed into Jupiter long ago and vaporized most of its core (David Shiga, New Scientist, August 11, 2010; and Li et al, 2010), the new calculations provide a competing explanation for its undersized core. The new calculations were used to model the behavior of magnesium oxide (a presumed major component of Jupiter's core) at Jupiter's core pressures of around 40 million Earth atmospheres and temperatures of around 36,000 °F (20,000 °C), which should cause the mineral to dissolve into Jupiter's surrounding fluid mantle. Conditions at Saturn's core, however, do not reach the high pressures and temperatures needed to dissolve such rocky minerals (Wilson and Militzer, 2011; Ken Croswell, Science NOW, December 16, 2011); Paul Scott Anderson, Universe Today, December 21, 2011; and Maggie McKee, New Scientist, December 22, 2011). deflections in the planet's magnetic field (more). 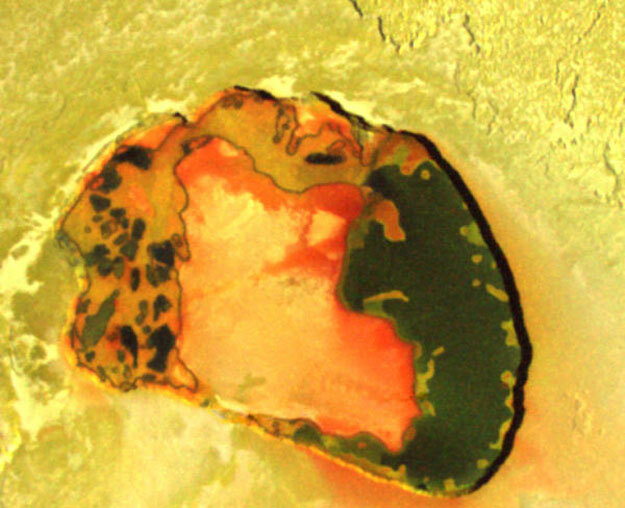 On May 12, 2011, scientists analyzing data sent from NASA's Galileo mission (before it took a suicide plunge into Jupiter on September 21, 2003) announced that its inner Galilean moon Io has a molten, or partially molten, "magma ocean" just 20 to 30 miles (30 to 50 kilometers) beneath the satellite's crust. The existence of such a magma ocean would help to explain why Io "produces about 100 times more lava each year than all the volcanoes on Earth." In addition, although Earth's volcanoes are found "in localized hotspots like the "Ring of Fire" around the Pacific Ocean, Io's volcanoes are distributed all over its surface." Scientists were able to detect the presence of Io's magma ocean because Jupiter's powerful magnetic field produces electromagnetic induction in magma, where a current forms on the outer edge of the molten rock layer and generates electromagnetic waves that can deflect Jupiter's field lines, an effect the Galileo probe was able to detect (NASA feature release; Nancy Atkinson, Universe Today, May 12, 2011; and Richard Lovett, National Geographic, May 13, 2011). The fifth planet from Sol at 5.2 times the Earth-Sun distance, Jupiter is the largest planet in the Solar System and so is visible in the night sky. Holding almost 318 times the mass of the Earth, it is more than twice as massive as all the other planets combined, with an equatorial diameter of 142,800 km (88,700 miles) that is more than 11 times wider than Earth's. 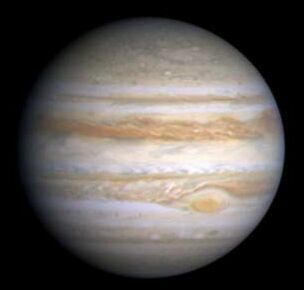 Jupiter is so big that it is close to the maximum diameter possible for a gas planet. If the mass of many more Jupiters were dumped on the planet, it would only get slightly bigger because of increased gravitational compression. Although stars can be larger because the heat of nuclear fusion at their cores works against compression, Jupiter is actually much too "light" to ignite hydrogen fusion like a star. Jupiter has only about 1/1,000th of Sol's mass, but it would have become a star if it was perhaps only 75 times more massive than it is. However, Jupiter is even too small to meet one of today's definition of a substellar brown dwarf because it can't even fuse deuterium (hydrogen nuclei composed one neutron as well as one proton) like young brown dwarfs that have accumulated at least 13 times the mass of Jupiter can. The planet has the most circular orbit of all the planets. 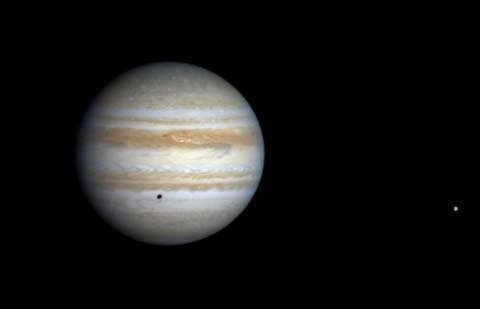 However, because of Jupiter great distance from Sol, its orbit takes almost 12 years to complete. In contrast, its very fast rotation results in a "day" that last only just over four tenths of an Earth day -- 10 hours. 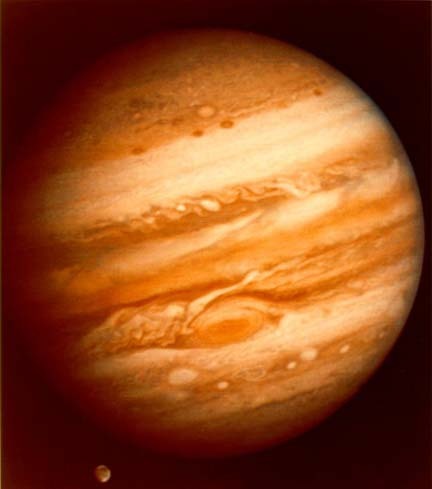 Jupiter's composition is very similar to that of the primordial Solar nebula from which the Sun is formed. The planet is made almost exclusively of gaseous elements (about nine-tenths hydrogen and one-tenth helium by numbers of atoms, but closer to three-quarters and one-quarter by mass) with traces of methane, water, ammonia, and rockier elements. Saturn has a similar composition, but Uranus and Neptune have much less hydrogen and helium. Like the other gas giants, Jupiter does not have a true solid surface. Its gaseous substance simply gets denser with depth. October 31 and November 9, 2000. 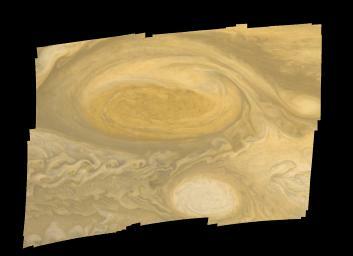 The Great Red Spot is visible at lower left of center. What we see of Jupiter is just the outer shell of its thick atmosphere which is composed of molecular hydrogen and helium. The atmosphere also has traces of water, carbon dioxide, methane, and other simple molecules that are gaseous or liquid when present on Earth's surface. 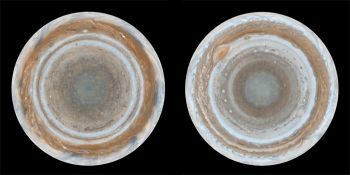 Astronomers believe that there are three types of clouds made of ammonia ice, ammonium hydrosulfide, or ice and water that float at different levels in Jupiter's atmosphere. As a result, colors related to each type of cloud are visible from different altitudes with red being highest, browns and whites in the middle, and blue farther down (where the lower clouds are seen through through holes in the upper layers). In addition, there are very fast winds (exceeding 640 km, or 400 miles, per hour) blowing in opposite directions in adjacent, wide bands of latitude, whose vivid colors result from slight differences in chemical make-up and temperature. The Great Red Spot is a huge storm measuring 12,000 by 25,000 km (7,500 by 15,500 miles), which is big enough to hold two Earths side by side. 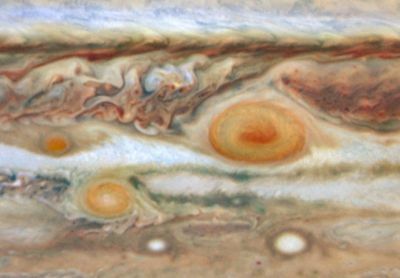 While Jupiter's cloud patterns can change within hours or days like on Earth, the Spot has lasted for over 300 years. Modern infrared observations and the counter-clockwise direction of its rotation suggest that the Spot is a high-pressure region whose cloud tops are significantly higher and colder than surrounding regions. 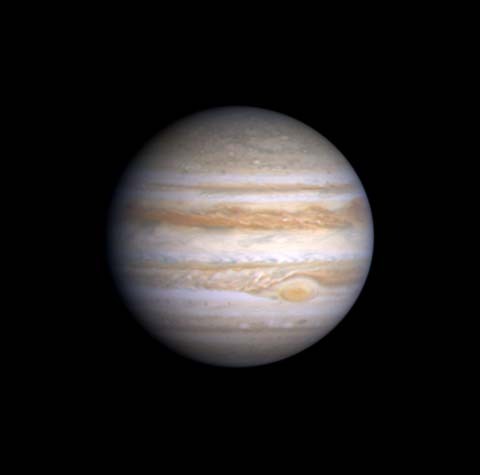 There are other, if smaller, storm spots on Jupiter, and similar storms have been seen on Saturn and Neptune. Some planetary scientists speculate that the Great Red Spot was created by the merger of smaller storms. On March 3, 2006, NASA announced that a large white spot ("Oval BA") -- about half the size of the Great Red Spot that had formed from smaller storms between 1999 and 2000 -- had changed color to brown then red (more information and images from NASA and Astronomy Picture of the Day). On May 9 and 10, 2008, astronomers observing with the Hubble Space Telescope and the 10-meter Keck II telescope found a third red (storm) spot near the other two. 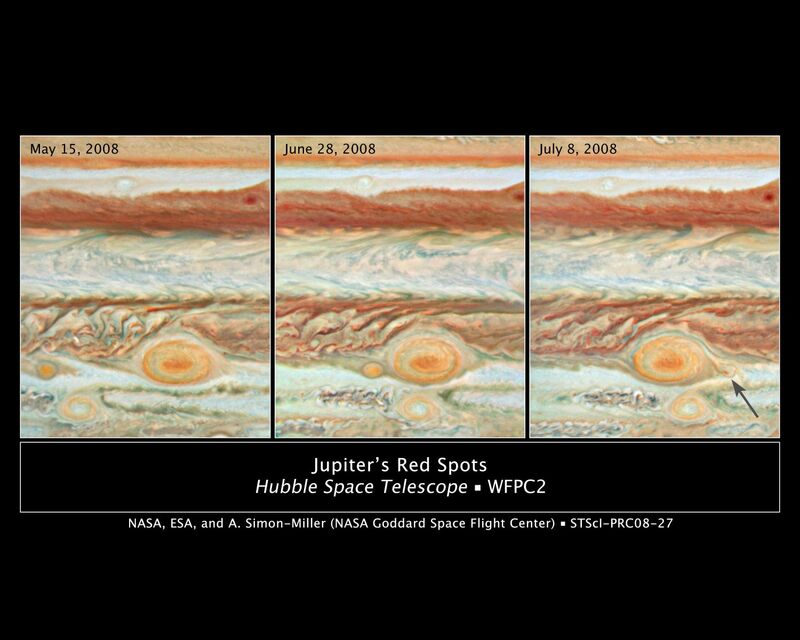 The second red spot formed in 2006, initially as smaller whitish storms that merged and later reddened. This latest and smallest red spot, however, was moving along the same band of clouds as the Great Red Spot and is drifting towards it. The tops of the three red storms actually extend above their surrounding clouds around some five miles (eight kilometers), and their red coloration is throught to be due to substances dredged up from below the clouds. While the Great Red Spot has almost twice Earth's diameter, the newer spots are less than one Earth-diameter in width. Jupiter's recent outbreak of other persistent, whitish high-pressure storms as well as red spots may be to large scale climate change as the gas giant planet appears to be getting warmer around its equator (U.C. Berkeley press release; hubblesite.org; and Astronomy Picture of the Day). 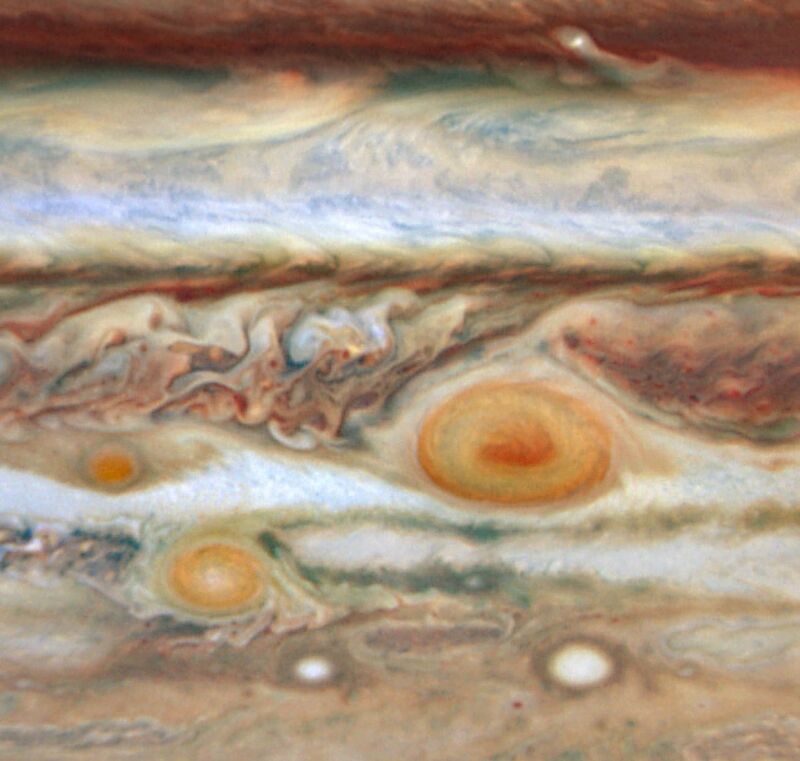 On July 8, 2008, astronomers following the movements of the third red spot found that it appears to been greatly diminished by a collision beginning July 3rd with the two larger and older red-hued, planet-sized storms on Jupiter and is now expected to be drawn in and absorbed by the larger storm (Great Spot) (Rachel Courtland, New Scientist, July 9, 2008; and Astronomy Picture of the Day). Infrared spectra of Jupiter's outer gas envelope suggests that the planet has less helium than the Sun in its upper atmosphere. This suggests that Jupiter's primordial helium (which is heavier than hydrogen) has been "raining" down through its hydrogen-rich atmosphere towards its center, although there must be planetary processes over time that move some helium back up. Moreover, the concentration of neon (which can dissolves in helium under certain conditions) is only one-tenth of Sol's and so may be lost below with the helium. Given its apparent depletion on Saturn, helium may also be precipitating out of Saturn's outer layers as well. Even hydrogen, the bulk of the substance of Jupiter other than some helium and traces of various ices, becomes liquid in the interior of the gas planet when the pressure exerted by the weight of the upper layers exceeds four million bars. (By comparison, one bar is the atmospheric pressure found on Earth's surface.) This liquid hydrogen occurs when the individual hydrogen atoms are broken up and the electrons are freed from the now bare nuclei. The liquid hydrogen is metallic in behavior and functions as an electrical conductor that generates a huge magnetic field that encompasses its moons and extends in a windsock shape all the way past the orbit of Saturn. Indeed, the particles trapped in its equivalent of Earth's Van Allen radiation belts would be immediately fatal to unprotected humans. According to astronomer Richard Crowe, since Jupiter's polar diameter is about six percent less than its equatorial diameter, the planet may have a rocky core of about 1.5 times Earth's diameter and around 10 times more massive than Earth -- three percent of Jupiter's mass -- that is resisting rotational flattening at the poles ("Ask Astro", Astronomy, October 2004). On November 20, 2008, The Astrophysical Journal Letters published the results of a new computer simulation indicating that Jupiter may have a central core of 14 to 18 Earth-masses of elements heavier than hydrogen and helium (including metals, non-metallic rocks, and ices), which is roughly double previously estimates. The gas giant may also have a few more Earth-masses of ices in the mostly hydrogen and helium mantle, which is consistent with the findings of the 1995 Galileo Entry Probe mission. 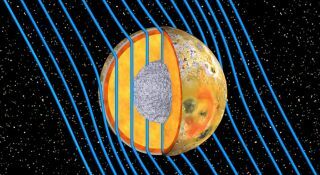 According to one of the researchers Burkhard Militzer, their results provide additional support for the theory that Jupiter developed through core-accretion of planetesimals, where a large planetary core forms before a massive outer layer of gas is attracted by the core's gravity (Militzer et al, 2008). These model results have not been accepted by all astronomers, however. On July 27, 2010, astronomers submitted a paper explaining how a collision with a relatively large rocky core of a "super-Earth" could have led to Jupiter's relatively small rocky core. Although Jupiter masses nearly 318 Earths, gravity measurements from space probes indicate that Jupiter's core masses only some two to 10 Earths, compared to a core of 15 to 30 Earth-masses for Saturn (and cores larger than 10 Earth-masses for Uranus and Neptune). Numerical simulations suggest that a large proto-planetary embryo with around 10 Earth-masses colliding with Jupiter would have flattened its rocky core "like a pancake" when it hit the gas giant's thick atmosphere before shattering Jupiter's rocky core about half an hour later, where the energy of the collision would vaporize much of the core's mass. Much of the vaporized heavy elements would have mixed with the lighter hydrogen and helium of the gas giant's atmosphere and left only a fraction of Jupiter's former core behind, which also would explain why Jupiter's atmosphere is richer in heavy elements compared with our Sun, Sol -- although the composition of the atmospheres of both objects should reflect their birth from the same Solar nebula. Although Saturn also has an overabundance of heavy elements in its atmosphere compared with our Sun, it may have absorbed such elements from a large number of impacts by planetesimals of lesser mass than Earth, which were small enough to be slowed and broken up by Saturn's atmosphere before reaching its core (David Shiga, New Scientist, August 11, 2010; and Li et al, 2010). On July 19, 2009, Anthony Wesley, an amateur astronomy, observed a large dark spot on Jupiter's south polar region (more). The new spot was subsequently confirmed in images by astronomers using the Keck II telescope (Keck news release; and Lisa Grossman, New Scientist, July 20, 2009). Like the 1994 impacts of more than 20 fragments of Comet Shoemaker-Levy 9, the "Wesley impact" was apparently the result of a recent collision with an asteroid or comet, which may have been a few hundred meters wide (more discussion and a Hubble close-up image of the atmosphere's "impact scar" from Science@NASA). 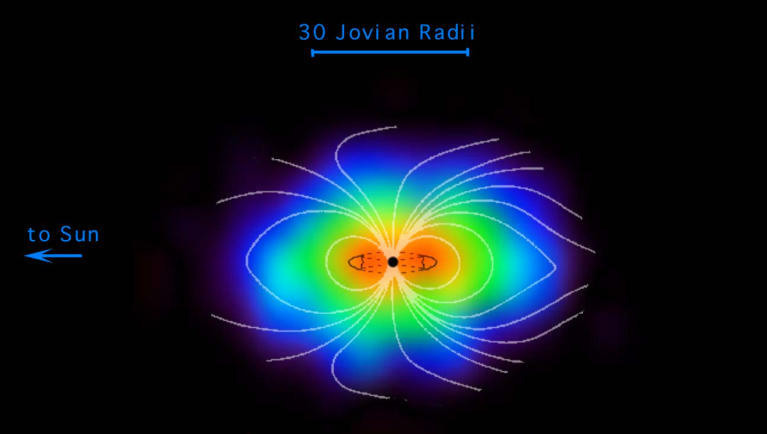 Contributing to Jupiter's radiation belts are particles from its moons Io and Europa. Volcanoes on Io spew out sulfur and oxygen atoms that collect in a donut-shaped cloud (torus) along the moons' orbit. A similar toroidal cloud of mostly hydrogen and oxygen gas also originates from Europa. Stretching millions of miles around Jupiter, the cloud may result from the bombardment of Europa's icy surface by ionized radiation from Jupiter's magnetosphere that kicks up and breaks apart water-ice molecules into its constituent atoms. The resulting atoms form neutral gases that are dispersed along Europa’s orbit and is estimated to mass around 60,000 tons. The cloud is hypothesized to act as both a source and a sink of charged particles. More on Jupiter's ring system is available from NASA's Planetary Rings Node. At latest count in May 2005, Jupiter has been found to have at least 63 satellites orbiting outside of its rings. (See an animation of the orbits of many of these satellites around Jupiter, with a table of basic orbital and physical characteristics, or a NASA fact sheet.) In addition to the four innermost moons, the next four are also the largest, called "Galilean" moons because they were first seen in 1610 by the astronomer Galileo Galilei, who was subsequently persecuted by the Church for suggesting that at least some celestial bodies do not revolve around the Earth. 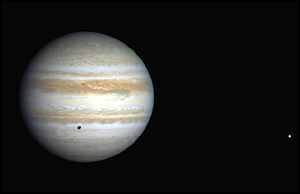 By order of their increasing distance from the giant planet, the four moons are Io, Europa, Ganymede, and Callisto. These Galilean moons are probably the last survivors of at least five generations of large moons that formed from the debris disk which once circled the gas giant during its formation (Canup and Ward, 2008; and Marcus Chown, New Scientist, March 7, 2009). As with Earth and its Moon, Jupiter's rotation is gradually slowing down from the tidal drag of the large Galilean moons, and these tidal forces are also gradually causing the moons' orbits to move farther away from the planet. 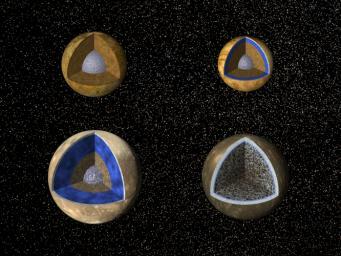 The three closest Galilean moons are locked into orbital manuevers called Laplace resonance. For each time that Ganymede orbits Jupiter once (in 7.2 days), Europa orbits twice (3.6 days), while Io orbits four times (1.8 days). These orbital motions cause gravitational variations that pull and pushes the orbits of the moons, leading to greater orbital eccentricity. The moons move farther then closer to Jupiter during each orbit, causing tidal flexing in each. black lava rock and yellowish sulfur-rich terrain (more). 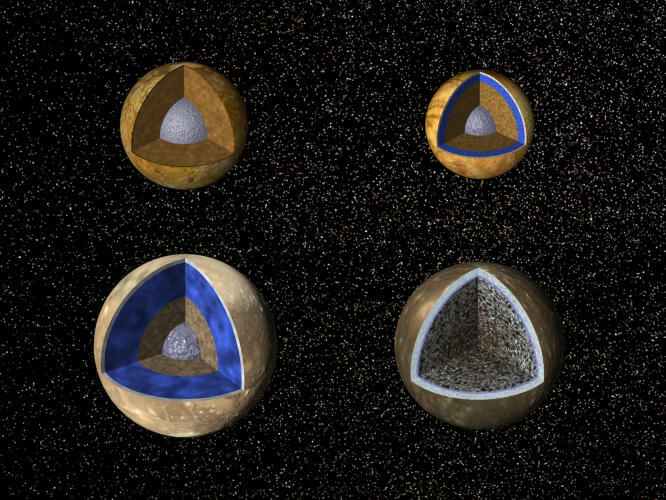 These tidal forces significantly heat the two innermost Galilean moons. 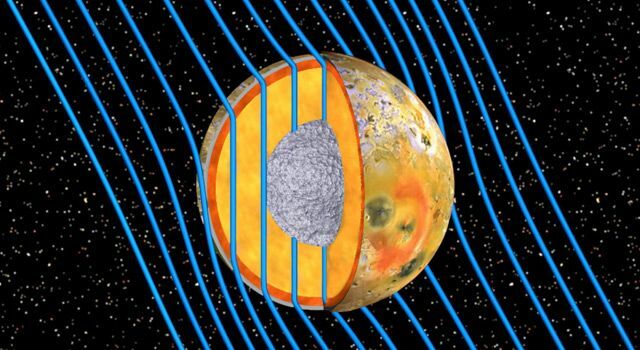 The gravitational pull of the mother planet and sister moons constantly yank and bend Io, heating it up in the same way repeated twisting heats up a metal wire. Two percent larger than Earth's Moon, Io has a molten interior and occasionally tremendous volcanic eruptions. As a result, lava lakes sizzle between 1430 to 1730 degrees Celsius (2,600 to 3,140 degrees Farenheit), although the temperature at other places on Io can be as cold as minus -160° C (250° F). This the intense heat probably caused any water present to evaporate billions of years ago, but it has generated a thin atmosphere of sulfur dioxide. In contrast, Europa (which is 12 percent smaller than Earth's Moon) appears to have a sparsely cratered shell of water ice that may be only 10 to 250 million years old. Estimates of the thickness range from less than 12 miles (20 km) to more than 90 miles (150 km) thick. 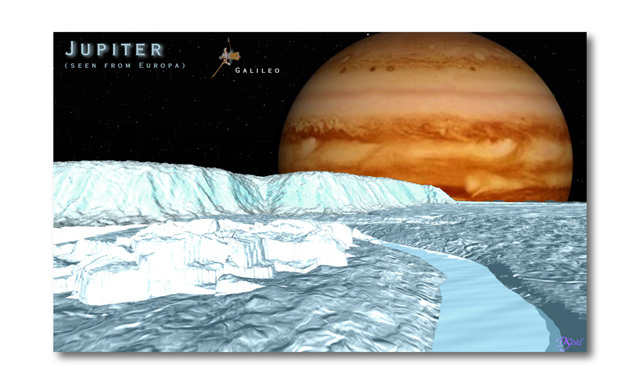 Most important, some of the ice below may have been melted by radioactive decay and tidal heating from gravitational interactions with Jupiter to create a deep ocean of electrically conductive liquid such as salty water that generates fluctuations in the moon's magnetic pole. Some scientists estimated in 1999 that this possible ocean may be at least 4.5 miles (7 km) deep, average about 100 km (62 miles) in depth, but range mostly between 80 and 170 km (50 and 110 miles). Biologists now speculate that, if liquid water does exist beneath Europa's shell of ice, then Earth-type microbial-sized or larger lifeforms may have developed as well (more discussion about the possibility of life on Europa can be found here). Near-infrared mapping spectrometer on NASA's Galileo spacecraft has also found evidence of the presence of molecules made of oxygen, carbon, sulfur, hydrogen, and nitrogen on Europa, and a suggestion of the presence of a class of complex organic compounds called tholins (see NASA news brief). Callisto and Ganymede are slightly larger in diameter (two and eight percent, respectively) than the planet Mercury. However, Callisto is about one quarter water ice. While Ganymede is denser, its bright surface is made of about 90 percent ice or frost. Recent evidence from the magnetometer aboard the Galileo spacecraft indicates that both Ganymede and Callisto may also have liquid oceans deep beneath their icy surfaces (see NASA news brief). The largest "moon" in the Solar System with a diameter near 5,270 km (3,270 miles), Ganymede (like Europa) has a very thin atmosphere of oxygen, while Callisto appears to have its oxygen locked up in ice and rocks as its atmosphere is composed of mostly of carbon dioxide instead. Ganymede is the only known planetary satellite to have its own dipolar magnetic field. It appears to have a dense core about 3,000 km (1,900 miles) in diameter of iron or iron sulfide, enveloped in rock. This core is surrounded by an icy mantle of about 700 km (440 miles). Because the orbits of the Galilean moons may have shifted over time, Ganymede may still be cooling off from past tidal heating, and so its core may still have sufficient heat to generate convection in its mantle to produce its magnetic field. rocks as its atmosphere is composed of mostly of carbon dioxide instead. 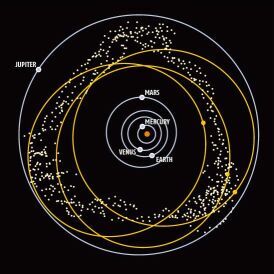 Farthest out of the Galileans, Callisto orbits outside the main radiation belts of Jupiter and so is not subject to the intense tidal forces that contort its neighboring sisters. It appears to have the oldest and most cratered landscape in the Solar System although its surface seems to show evidence of geologic activity. While it was long thought to be a dead world, Callisto appears to have weathered some type of erosion, perhaps from the evaporation of carbon dioxide ice. Some of Jupiter's outer moons are and clustered in two distinct groups. The inner group are all inclined between 24 and 29 degrees from the planet's equator, while the outer group is even more greatly inclined between 147 and 164 degrees -- which means that the outer moons are basically in retrograde orbits. Not only that, some of the outer moons are black from the presence of carbonaceous minerals like those found in certain dark asteroids and meteorites. Hence, it is possible that some of these outer moons are cometary or asteroidal bodies that were captured Jupiter's gravity and perhaps fragmented by collision or drag forces. In recent years, astronomers have found numerous small moons, including satellites discovered up through May 2005, all of these moons are very small, with estimated diameters ranging from one to eight kilometers (about 0.6 to five miles) (more). Like the other outer moons suspected to be captured cometary or asteroidal bodies, these moons have large and highly eccentric orbits, and virtually all move in retrograde orbits. Jupiter could have captured the moons during the first million years of the Solar System's development by growing so fast that it captured nearby objects. Another theory suggests that the planet's atmosphere slowed passing asteroids enough to trap them in orbit. Since 1906, astronomers have also discovered around 1,600 objects that share a similar orbit with Jupiter. A list of these "Trojans" objects and their orbital characteristics is available from the IAU. Astronomer Scott S. Sheppard has more discussion on Jupiter's "Trojan Asteroids, including a chart of the stable 60-degree Lagrange clouds of these objects (at the leading L4 and lagging L5 points in Jupiter's orbit around the Sun). and Franklin et al, 2004). According to computer simulations inspired by the finding of "hot" Jupiter-class planets found in inner orbits around nearby stars, the Solar System's own Jupiter may have formed 10 percent farther from the Sun than it is now, and then spiralled in by about 0.45 AUs (70 million kilometers or 44 million miles) over at least 100,000 years as it lost angular momentum to drag within the thick dust disk that surrounds young stars. 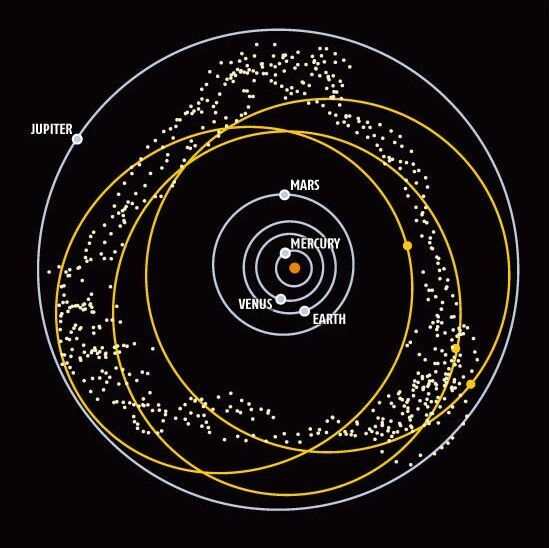 Supporting evidence of this in-migration from an unusual group of 700 or so rocky bodies known as the Hilda asteroids, which orbit the Sun three times for every two made by Jupiter, and of which vast majority have slightly elongated elliptical orbits, whereas many other asteroids have near-circular orbits. 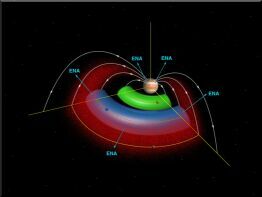 Computer simulations (led by Fred Franklin’s team at the Harvard-Smithsonian Center for Astrophysics) indicate that Jupiter's early in-migration would have ejected any proto-Hilda asteroids with circular orbits from the Solar System and would have further elongated the orbits of those that remained (Franklin et al, 2004). Luckily, Sol's dust disk was probably thin compared with those stars that dragged their outer gas giants into inner orbits closer than Mercury or into the stars themselves, perturbing the orbits of any developing, inner terrestrial planets. Indeed, astronomer Phil Armitage speculates that the in-migration of Jupiter could also have disturbed the proto-planetary bodies of the inner Solar System so that they collided more frequently, to spur the formation and growth of Earth itself. 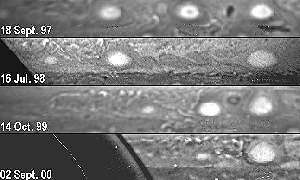 More images of Jupiter and its moons are available at NASA's Planetary Photojournal and from the Cassini-Huygens Mission and the Cassini Imaging Diary for Jupiter. Fact sheets on Jupiter and its moons and rings are also available from NASA's National Space Science Data Center. Preliminary orbit data on new satellites discovered through March 2003 are available from astronomer Sam Shepard at the IFA and the Jupiter Satellite Page. For more information about the Solar System, go to William A. Arnett's website on "The Nine Planets", or to Calvin J. Hamilton's web page on "Jupiter".